Visvesvaraya Technological University (VTU), Belagavi, Karnataka has declared the results of examinations conducted on June and July months of 2017 for BE and BTech steams. New Delhi: Visvesvaraya Technological University (VTU), Belagavi, Karnataka has declared the results of examinations conducted on June and July months of 2017 for BE and BTech steams. In a latest update, VTU has published has said that the technological university has published the results of 8th Semester Bachelor of Engineer (BE Non - CBCS) and Bachelor of Technology (BTech Non - CBCS) of all the streams. VTU had published the BE 8th semester exam results of both Civil and Mechanical branches of all regions recently. Candidates who have appeared for the examinations on June and July months in all these streams may check their results on the official website of Visvesvaraya Technological University (VTU). As it had happened earlier the official website of VTU may not respond. This happens when large number of users try to access a certain website at the same time. 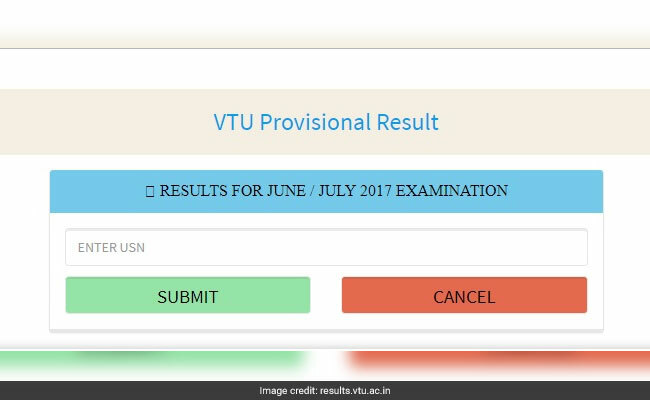 Candidates who are searching for this VTU BE BTech June-July exam 2017 results are advised to have patience if the website do not respond. "June / July 2017 Examination Results of VIII Sem B.E. / B.Tech (Non - CBCS) announced for all regions. New Updated," said the latest update from the official results website of VTU. Step 1: Go to the official website of the Visvesvaraya Technological University (VTU), vtu.ac.in.